Book festivals are great fun for readers and great business for authors and publishers. While no means exhaustive, here's a broad sampling of the major book festivals that take place in the U.S. The Brooklyn Book Festival is “the largest free literary event in New York City,” the center of US book publishing. Featuring over 250 literary stars and emerging authors, the Brooklyn Book Festival features booths, authors, and signings, and panel discussions and “this hip, smart, diverse gathering attracts thousands of book lovers of all ages.” The BBF is "bookended" by Brooklyn Bookend Events, literary-themed events like film screenings, parties, children’s theatre, and literary games taking place across the borough in clubs, parks, bookstores, theatres, and libraries. The National Book Festival is held on the National Mall in Washington, D.C. in September. The two-day event has been held since 2001 and generally features over 100 authors, many literary luminaries among them. Free and open to the public, the National Book Festival is organized and sponsored by the Library of Congress, as well as the National Endowment for the Arts. Held in September each year, the Baltimore Book Festival is sponsored by the City of Baltimore and the Maryland State Arts Council. The fest features author readings and book signings, cooking demos by celebrity chefs, poetry readings and workshops, panel discussions, walking tours, exhibitors (like literary tee shirt and tote vendors, food vendors, etc.) and booksellers. For kids, the Baltimore Book Festival has storytellers, hands-on projects, and other performances. The first Texas Book Festival took place in 1996. Established by First Lady Laura Bush, the Festival celebrates books and their contributions to the culture of literacy, ideas, and imagination. Mrs. Bush, a former librarian, wanted to honor Texas authors, promote the joys of reading and benefit the state's public libraries. Held in October in the State Capitol, Austin, the Texas Book Festival hosts over 200 Texas and nationally known author along with about 40,000 visitors to the weekend of author readings and presentations, panel discussions, book signings, and musical entertainment. The Louisiana Book Festival is a one-day event sponsored by the State Library of Louisiana, the Louisiana Center for the Book, the Louisiana Library Foundation and other government and retail entities. The literary festival is free to the public and is held in and around the State Capitol in Baton Rouge in October. In addition to events such as author appearances and signings, the Louisiana Book Festival features a day of writing instruction for would-be authors and an Author’s Party fund-raiser for the Louisiana Library Foundation. “The nation’s finest literary festival,” the Miami Book Fair International draws hundreds of thousands of visitors each November. Established in 1984 by Miami Dade College and community partners, the Fair is now part of the Florida Center for the Literary Arts at Miami Dade College. The Fair hosts "Evenings With..." readings and discussions with notable authors; a Street Fair that features more than 350 authors (including Latin American and Spanish authors) reading and discussing their work; and more than 250 publishers and booksellers exhibiting and selling books. 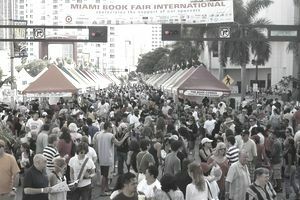 The Miami Book Fair International's Children’s Alley activities, including theater, arts-and-crafts, storytelling, and readings by children’s book authors. Jewish Book Festivals are generally regional and local events that take place in or around Jewish Book Month and that is great for promoting books about subjects of interest to that community—whether modern living or Torah studies. Held each March in Charlottesville and Albermarle County, VA — an area also home to the University of Virginia, Jefferson's Monticello, and other cultural and educational sites — the fest is "five days and hundreds of authors." For more info, visit their website. The Los Angeles Times Festival of Books was created in 1996 to promote literacy, celebrate the written word, and bring together those who create books with the people who love to read them. Free to the public, the festival features hundreds of authors, over 300 exhibitors, a Children’s Stage, a Cooking Stage, a Young Adult Stage, the Los Angeles Times Stage, Poetry Stage, panel discussions and writing seminars. Presented in association with the University of Southern California, the Los Angeles Times Festival of Books draws between 130,000 and 140,000 each April. The Chicago Tribune Printer's Row Lit Fest is considered to be the largest free outdoor literary festival in the Midwest. It generally takes place each year over two days in early June, in the historically significant Printers Row neighborhood of Chicago. The event features authors, performers, and presenters who participate in hundreds of panels, discussions, as well as hundreds of booksellers from across the country displaying new, used and antiquarian books. The Printer's Row Lit Fest is one of the pre-eminent literary events in the United States.